The Sunset High School robotics team won the 2017 UIL Robotics State Championships in Conference 5A-6A of the First Tech Challenge Division! The UIL Robotics State Championships were held May 19-20 at the Austin Convention Center. The Sunset team members are Karen Garcia, Valerie Alvarez, Maria Diaz, Jennifer Servilla, Samantha Morales, Ana Palomares, Ivan Martinez, Nick Moncada, Jesse Estudillo, Allan Cruz and Alexander Alonzo. The robotics coaches include Gary Dimanh, Jacob Soto, Lakisha Farrow and Calvin Harris. 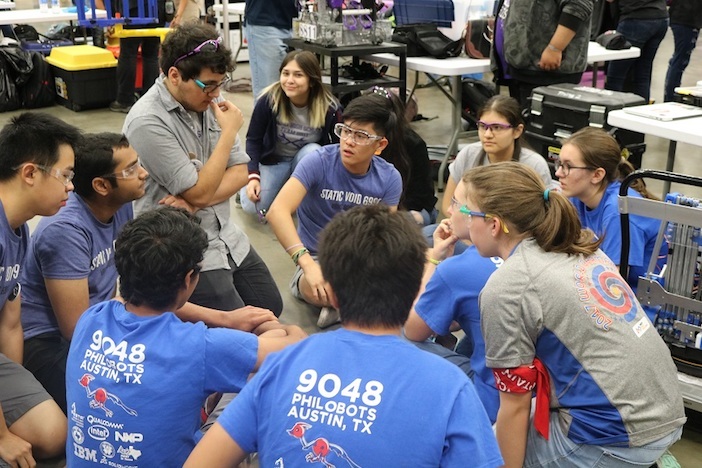 UIL First Tech Challenge (FTC) is a robotics competition for teams in 9th – 12th grades.. Students are challenged to design, build, program and operate robots that compete in a head-to-head challenge. The competition begins at a local level and teams can advance through multiple stages to reach the world level.